Plug an electric stair lift into your home's outlet for power. The power runs directly from the outlet to the motor. 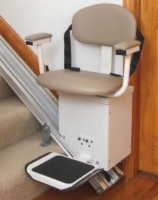 Unlike battery powered stair lifts, if you lose power to your home, the stair lift will not run. However, AC stair lifts have lower maintenance costs because there are no batteries to replace. 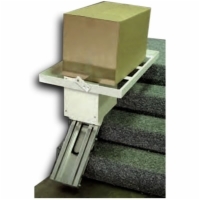 Electric stair lifts are cable drive types and include heavy-duty and outdoor stair lifts. 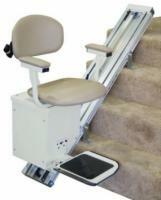 Each stair lift listed is designed for homeowner installation. Installation takes approximately 3 hours. A stair lift is a mechanical device for lifting people and wheelchairs up and down stairs. For sufficiently wide stairs, a rail is mounted to the treads of the stairs. A chair or lifting platform is attached to the rail. A person on the chair or platform is lifted as the chair or platform moves along the rail. Modern stair lifts can be found with a wide variety of features such as adjustable seat height, battery isolation switches, call stations, 'flip-up' rail, key switch, folding step, speed governor, seatbelt, soft start and soft stop. Stair lifts normally have "soft" starts so the user is not jerked as the carriage starts to move. Typical travel speed for domestic straight rail stair lift carriages range between 13.78 feet per minute, 0.16 miles per hour and 30 feet per minute, 0.34 miles per hour. The speed of curved rail stair lift carriages may vary on the journey if the controls cause them to slow on inclines and bends.